Discovered and made famous by Ricky Gervais this ‘little bald headed manc’ as Gervais likes to call him has gone on to create laughs just as loud as Mr G and Stephen Merchant have managed. He may say some really stupid and dumb things, but he is also very witty, and his mind works in a very unique way! The comedy industry is lucky to have him. Here are some of Karl’s best lines. If you are a fan of Karl’s he has all sorts of books and DVDs you can get online and on the high street. Don’t forget his other work with Ricky and Stephen Merchant including their hilarious podcasts in the App Store. 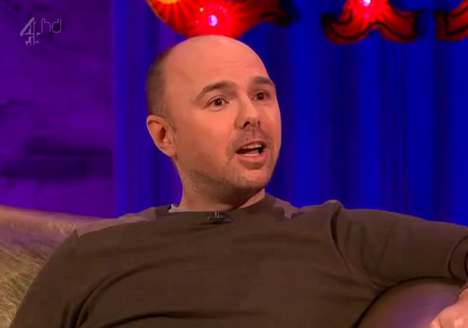 Karl Pilkington began his professional career as a radio producer in London for XFM. His friendship with comedian and actor Ricky Gervais catapulted him into stardom. Born September 23, 1972, Karl was the producer for the radio broadcast of The Ricky Gervais Show co-starring Stephen Merchant. During the show, Karl would occasionally stop in to give his hilarious and unique observations about show topics. In time, he would be a regular guest on the show as it moved to an animated version for HBO. In 2005 he co-hosted with Russell Brand BBC 6 Music. While Gervais was making news with his HBO show Extras, Pilkington made a cameo appearance on the finale. Most recently he stars in the Gervais hit show Derek where he plays one of the major characters, Dougie, who is caretaker and bus driver. In solo work, Karl has also done voice-over jobs. He’s worked with One Stop Office Shop, Wickes, Sony PSP, and many others. His most recent solo effort was in the SKY 1 series The Moaning of Life. He is married to Suzanne Whiston, who is often the topic of conversation, especially in regards to the idea of marriage and relationships. Suzanne is often talked about, never much seen! I’ve been a fan of Karl Pilkington for a few years now. I think we saw/heard the best of him on the radio (the animated series were awesome). It’s interesting how many times he has a very good point, sometimes it’s something that great thinkers have said, but he just makes a mess of wording it. I think his bald orange-like head is to blame. Too much UV radiation going into his head. It’s things like this that portrays how some of the funniest content is when comedians can get their experiential cases in life, and make something comical out of it! Karl is brutally honest, and that’s what adds on to him being funny, open, and full of quips! That is some funny stuff! I like the one on Volcanoes..keep a few fill the rest in. I got a good laugh just by reading this and you know, laughing is good medicine. He is witty and would be a hoot to sit and talk to.